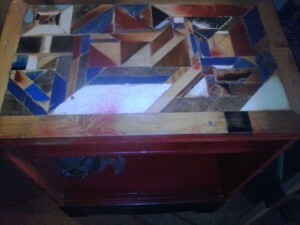 It’s officially May and my cabinet does not have doors, so now it is a deep shelf storage unit with a mosaic top. I have trim that I will nail to the face and the sides and post to etsy. I was going to do some outline painting inside the cabinet, but I might not. I am working with a new type of paint and I don’t think the paint I have now is compatible with the new stuff. Looking for inspiration we hit the streets of downtown Bennington on Friday and wandered into Jays cards and gifts on Main street in Bennington VT. They were celebrating 44 years in business with a sale, 50% off all items. They reach a milestone and we get the gift! 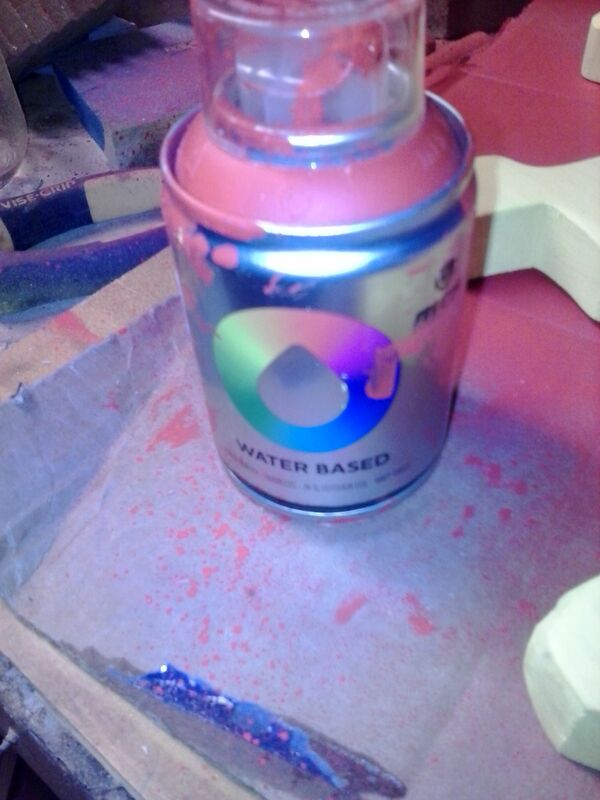 They sell a water based spray paint made by Montana colors that is used in mural work and graffiti, it comes in tiny 100 ml spray cans and it is amazing. I sprayed two of my stars yellow and two of them red and they look great! I probably could have gotten away with one coat but I missed a small spot on an edge that would have driven me crazy. I am going to use the traditional glue and screw attachment method put on some razor hangers and voila one more project completed. It is not due until July but I need to start making mock ups soon. This entry was posted in old projects, on-going projects, process, scrap wood, wall art, wood working by brighid. Bookmark the permalink.